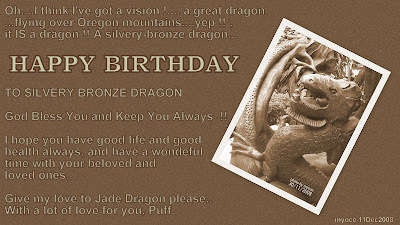 My dear dragons, sorry for the unpretty dragon picture...I was going to draw one for your birthday, SB-dragon, but err...I think...even if I tried till my face turns blue...the result will probably be closer to a lizard...I didn't want to insult your Draconian senses...Wishing you the bestest from Indonesia, Puff Dragon. Atra gulia un ilian tauthr ono un atra waise skoliro fra rauthr ! I am honored and bedazzled by this lovely carving! Thank you, Puff, for this. It's beautiful, and so nice with the card surrounding. I will carry this joy from you with me among the clouds (as soon as the rain quits and we dry and freeze a bit). Ha ha ha Silver Bronze has come out of his warm lair !! I'm glad you like it. Hubby asked me why not send a pic of Komodo Dragon? They normally just gnaw on something and wait for the infection from their septic saliva to take hold, usually doesn't take long. Much more deadly than a human bite, or so I've read. Full moon on snow. Winter reaches with a long arm here this year.